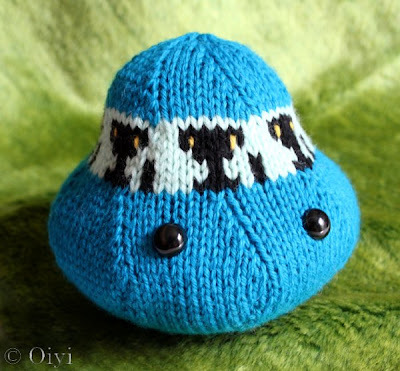 Oiyi's Crafts: Knitting Mochimochi Review & Giveaway! Knitting Mochimochi Review & Giveaway! 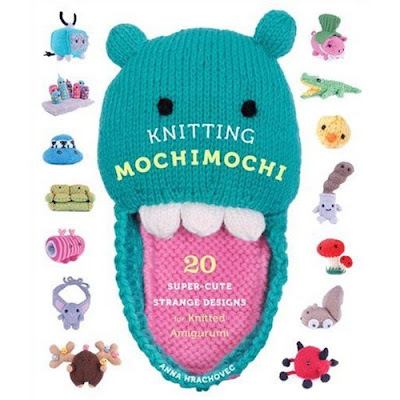 Anna Hrachovec's new book, Knitting Mochimochi, is fresh off the press. 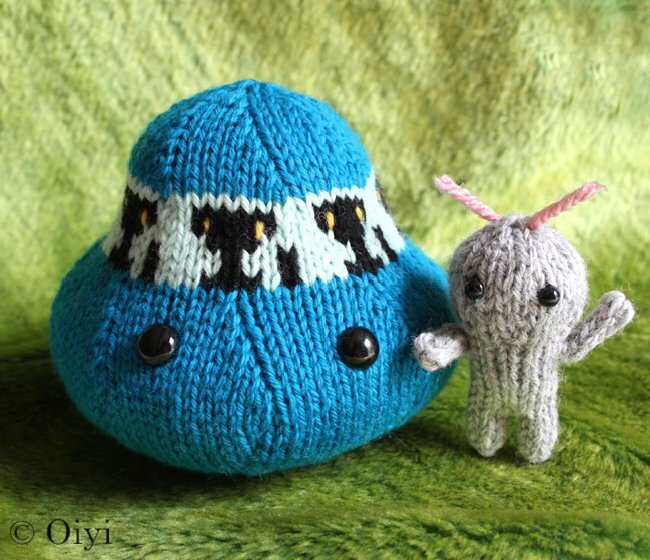 I have been test knitting Anna's patterns since the beginning when she launched Mochimochi Land in 2007. We met via Flickr and I was her first test knitter. Now, 3 years later, she has released her first book! I am honored to be able to review her book. I also have a extra copy to give away to one of you lucky readers. Details to follow at the end. I have always enjoyed knitting toys. Unlike garments, they don't have to fit anyone and there is no need to check your gauge. They don't need to make sense because it's a toy. Anna's toy patterns has always been on the quirky and fun side. She says that her toys are inspired by everything cute, funny or strange that she sees. As you will see in the following photographs, the patterns are definitely fun and cute. One of the reasons I love Anna's patterns is the construction techniques. The patterns are as seamless as possible. You might be required to stitch up a few limbs or seams on some of the patterns, but she really does try to minimize that. She is quite inventive and clever with how her toys are knit up. There is detailed instructions and photographs to help you out with certain aspects of the pattern. Which I always find very helpful in any pattern. With any toy pattern, it really does matter in how you assemble it. When you take the time and care to put a toy together, you get a professional result in the end. Anna has included a section in the book called Basic Toy Techniques. In that section, these topics are covered; The Stuffing, The Closing, The Eyes, The Seaming, The Loose Ends, The Embroidery, Additional Techniques, and The Magic Loop. The topics have step by step photos to help you in understanding the technique. One of my favorites is the Seaming Section. She covers 7 different Mattress Stitches that will help you seam up your toys. For those of you who would like to try your hand at designing a toy pattern, she has a section called Design Your Own Knitted Toy. She starts off with a sketch of a Pig and helps you break down the sketch into sections. Then step by step, she walks you through on how to plan it, number it, knit it, check it, continue it, appendage it, finish it and write it and share it. She also includes guidelines for 4 basic shapes and increases and decreases to shape the design. There are 20 super-cute strange designs in the book. From small quick projects to more elaborate projects. The Impractical Wearable chapter has patterns that you can wear! There is something for everyone. You can be a beginner knitter and still be able to make something fun from this book. I recently had the opportunity to help Anna knit up 5 samples from the book with the original yarn and colors done in the book. They are for Cascade Yarns, which will be used for a traveling trunk show to promote Anna’s book. Cascade Yarns generously donated the yarn, Cascade 220 Wool. Believe it or not, it was my first time using Cascade 220! The colors are great and I love the feel of the yarn while working with it and the finished results. Bite-Free Bed Bugs Orbiting Oddity The little guy next to him is Squoze from the pattern Hugs and Squoze. Baby Gators Neck Nuzzler TV Guy For a chance to win a copy of the book, please leave a comment stating that you want to be entered in the giveaway. Anyone can enter, even for those of you outside of the United States. The last day to enter will be July 8, 2010. The winner will be picked by a random number generator. I will announce the winner on July 9, 2010. If I don't hear from the winner after 1 week, I will draw another name. Good Luck! A huge thank you to Watson-Guptill for providing me a copy to giveaway to my readers. Sooooo cute. I'd love to win this book! What a wonderful book. I have never knit any of her toys but I love the gator and the neck nuzzler! Please count me in the draw too. How lucky are you to be a test knitter for her too. 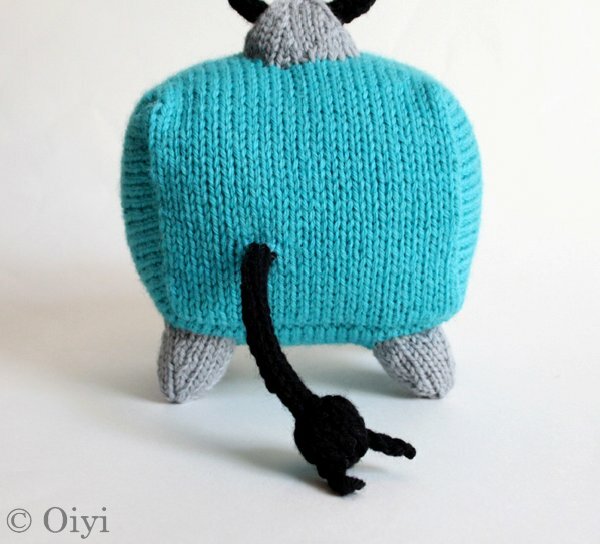 To be honest, I never understood the appeal of these kinds of knitted toys but now, seeing them up close on your blog? Unbearably CUTE!!! I want to fill a whole room with these adorable little creatures! Enter me please! This would be a lovely birthday present for me. I'd like to be entered in the giveaway. Wee! your knits look so cute! i'd love to be entered to win this :) thanks! thanks for hosting such a great giveaway! all of anna's designs are so darn cute! Thank you for the great giveaway! I would love to win Anna's book. She's a great inspiration! Love that squirrel on wheels! So cute! Please enter me in the draw. You have knit absolutely the cutest creatures ever! The baby gators are great. I'd like to be entered! That book is too cute! 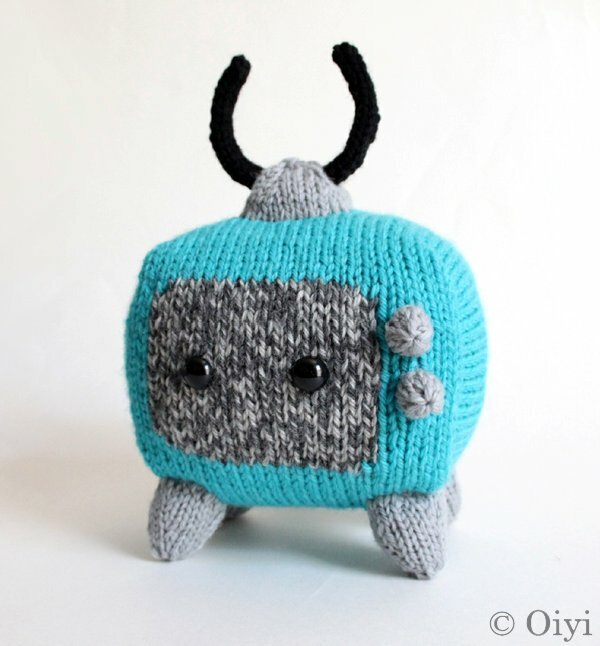 Her designs are soo cute, love that little t.v. I'd like to be entered for the giveaway! Cute! I'm on a toy kick! Please enter me in the giveaway. Cute as always. The baby gators are hilarious. I just fell in love with the alligators. They are too cute! Thank you for entering me in your contest! I would love to win that book. I only crocheted animals and other creatures and would give it a try with this book. That spaceship is too cool for school! It makes me think of the Jupiter V from Lost In Space. I'd love to win this hook, thanks for the opportunity. Too cute! Please enter me in your give away. Please enter me, these ae so adorable. Thanks. This book sounds fantastic - love that she gives you extra help and tips - something I need. Please enter me in the drawing. Love these!! 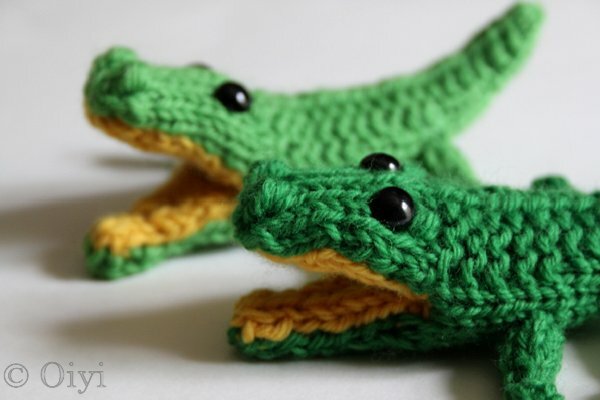 I saw your croc on Ravelry and was smitten. Please enter me in the book giveaway. My fingers are crossed! Sorry forgot to leave the email open. Count me in for the giveaway! As always, your examples take the cake! I've always loved her patterns and I'm thrilled there's now a book. Please enter me in the draw. It looks like the projects will be a lot of fun to knit. Oh, everything looks perfect! Now I'm thinking I might make the alligator next... So cute! Thanks for the great giveaway! What a cute book! I've always wanted to make something from mochimochiland but haven't actually gotten around to it yet. Your knitted work is great! I love Anna's designs, they are fantastic! I am currently working on Hugs and Squoze, loving how it is coming together. I really like Anna's work. She's a great knitter. 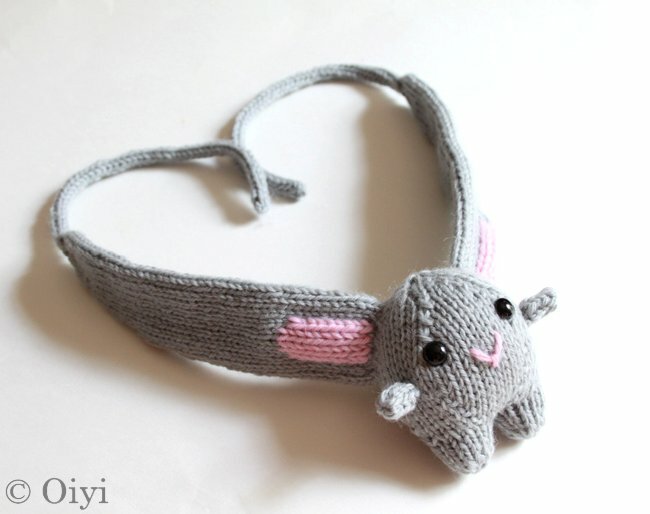 I just saw your work on her blog (that's where I came from) and your Neck Nuzzler is sooooo cute! Congratulations! Adorable! I'd love to win a copy of the book! love your test knits! How can you go wrong with such cute patterns? I see many playfil hours in the toys, so I would love to see it here in Denmark. I hope I hope the random number generator picks me! I can't wait to dive into toy making. Please enter me in the giveaway! Love your TV Guy. I too would love a chance to win a copy of this book! Her first book! That's so exciting. I'd love to win a copy of it. These new creatures are adorable. How many of them has Melody adopted? I'm a big fan of Anna's patterns, and would love to be entered into the contest. Thanks for sharing such cute photos! So cute! I would love to get my hands on this and try a few myself. Thanks for the giveaway, and for including us Canucks and other non-US readers! I would love to win a copy of this book. Can't wait to make the adorable bedbugs!! This book looks so cute! please enter me in the draw! I want to be entered in the give-away! I love these toys, and I want to get the book so badly. I'd like to be entered in the book give-away! Thank you! Fingers crossed my name comes up! Hi Oiyi! It's been a long time, but I'm back! I can't believe how much your daughter has grown! She is adorable. So are all of the cute little toys, especially the gators! I see you are having a contest, so please throw my name in the 'giveaway' hat! I definitely want a chance to win her book! I love Mochimochi patterns! I want this book badly. Please enter me in the drawing! Thanks. Haha! What cute toys. I especially love the TV. I've really been looking forward to this book. 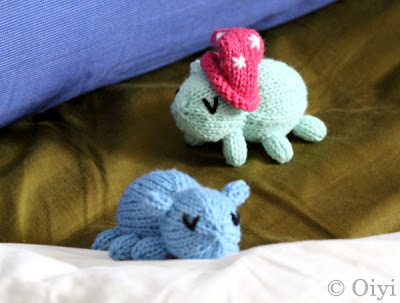 Anna's designs are so amazing and different and I can't wait to get my knitting fingers around the toys! How fun! I always love seeing the new mochi mochi patterns that you knit up. That tv is too cute for words! Anna's patterns are so cute! I would love to have a copy of her book! I love this book! Can't wait to CO Baby gators. Toys are my favorite thing to knit too! I've love to get some tips from Anna. Please enter me in the giveaway. :) Thanks! I would love to be entered to win a Mochimochi book. I've been looking at her patterns and they are so cute! Great Article and Giveaway! Oh dear - those gators? And that neck nuzzler? Toooooooo cute. That sounds like a really great book - I would love to win one. 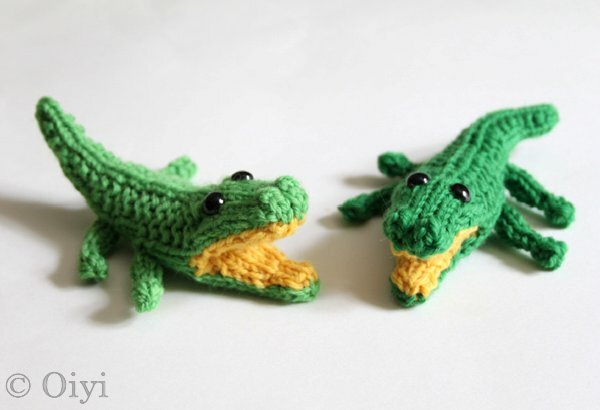 Love all your little samples - I think the gators are my favorite. I love Anna's patterns. Put me in the hat to win this one!! Thanks for the chance! I & my kids are avid Mochimochi fans! Been following Mochimochi for years now - absolutely adorbs! I'd love to win the book! 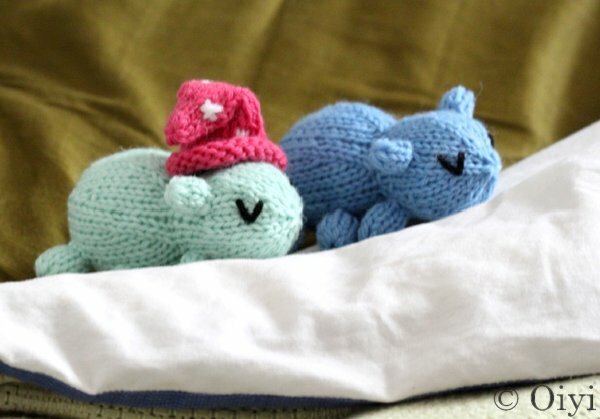 i love knitted toys - and the ones you've made are absolutely adorable!